It’s just my hunch, but I’m betting that we consume less “Champagne” per capita in the U.S. than most European countries. And here’s my second hunch: I’m also guessing that most of us first chill the “Champagne,” then open it right out of the fridge, giggle at the pop of the cork and then most of us pour it into a glass and – while it’s still foaming – lift the glass and make a toast. We view champagne as befitting special occasions. That’s what we've been told and what we have been sold. But I don’t think we much like it. Not really. And that’s too bad. And here’s my last hunch: the reason we don’t like it is because of the chilling-popping-pouring-drinking scenario. Whether it’s Champagne, sparking wine, Cava or Cremant d’Alsace, bubbly is wine. And there are enough styles within that family of bubblies to make them much more enjoyable if we just treat them as such. First, most bubblies are kept too cold. That’s OK. If it wasn't, your refrigerator would not be a safe place to store your food. But sparkling wine really is best appreciated at 45 (F) degrees, much warmer than your refrigerator setting. So just take the wine out and let it sit a while. Second, open the bottle (aside from not using a corkscrew) as your would other fine wine – be it true Champagne, or a sparkling wine from any country made in the traditional method such as Crement d’ Alsace, or labeled as Metodo Classico from Italy. By that, I mean let it breathe a while. Doing this will allow the aroma and flavors to develop. Use an appropriate glass (I prefer the flute) but then allow the wine to sit in the glass. Enjoy the color. Look at the bubbles (mousse), and allow them to settle a bit before consuming. The mousse provides a texture and that’s enjoyable. But all that aggressive fizzing when it’s first poured into the glass interferes with TASTING the wine. Some time ago, I was invited to participate in tasting four sparkling wines from France’s Alsace region. Since Alsace is not within the boundaries of the region of Champagne, these bubblies cannot properly be labeled Champagne, so they are referred to as Cremant d’Alsace (roughly “sparkling wine of Alsace”). Credit goes to France for practicing what they preach. And bargains go to everyone because these wines are traditionally made (twice fermented) and offer excellence in taste but also terrific value price wise. The first thing I noticed was that, for each wine, the corks removed easily and produced only a soft “pop” – a sign of quality. Lucien Albrecht is a blend of 80% Pinot Auxerrois (a cross of Gouais Blanc & Pinot Noir), 10% Pinot Blanc and 10% Chardonnay. In the glass, it is beautiful and classic with its pale straw color. The nose offers yeasty, fresh baked bread and is floral and elegant. The mousse (bubbles) are small – another sign of quality – and the mouthfeel is silky and glycerol. There was taste of crisp apple and a hint of almond with honeydew melon in the back taste as the wine warmed. The finish was elegant, the mouthfeel creamy. I enjoyed immensely the wine’s toasty, autolytic character. O.K., full disclosure here: I’m a “sucker” for Blanc de Blancs, but at retail prices between $16 and $23, this sparkling wine tastes much higher than it is priced. On to Gustave Lorentz. The wine is a blend of 33% Chardonnay, 33% Pinot Blanc and 33% Pinot Noir. As with the other Cremants d’Alsace, it is made according to the “Method Champenoise” (traditional method with the second fermentation in bottle). Aging is done “sur lattes” with daily bottle rotation in order for the yeast deposit to accumulate in the neck of the bottle for disgorgement. As with all “Methode Champenoise,” that’s a lot of work and one wonders how it can be retailed for a SRP of $25. But who am I to argue? The wine offers a seductive floral nose and a chalky whisper of minerality. It presents a citrusy taste of lemon-lime which I hadn’t expected but enjoyed and a bright finish that softened somewhat yet remained crisp with citrus. The color of Dopff & Irion was pale rose-amber and absolutely beautiful in the glass. Wisps of strawberry were present in the clean and very light nose of this 100% Pinot Noir wine. The mousse was exceptionally long lasting and brought tastes of faint strawberry and white chocolate to the palette. The finish offered candied strawberry and the mid palette was (for me) a touch sweet which would be a plus for those preferring something less austere than a Blanc de Blanc Brut. Since that isn’t me, I swirled the wine (heretically, I know) in the glass and preferred the result of that toning down the perceived sweetness. Charles Baur, also 100% Pinot Noir, it finished the tasting and although I lean to the Chardonnays, I found this wine captivating and was taken in by its layers of flavor. At an ARP of $18, I was also taken in by its thriftiness. The wine is a pale, muted pink in the glass. Though its floral noise is touted, I wasn’t able to appreciate it until the wine got some air. Fortunately, it was last in the tasting and as things progressed, that’s exactly what developed. Its nose was enticing. I tasted tart rose petal and bitter orange and, as the wine aired even more, strawberry. Layers of flavor indeed! The taste sits on the mid palette and develop a long finish. A great summertime party wine. 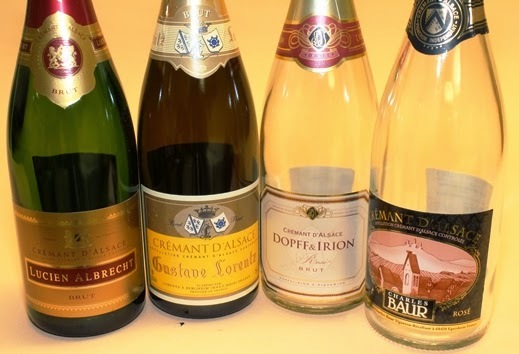 Cremant d’Alsace offers great quality and value and enough variety to suit most every taste. They are wonderful with a variety of foods offering cleansing and crisp finishes as they do. If your experience with “sparkling wine” has been of the “popping-pouring-drinking” scenario, I’m not surprised you limit (if you do) that experience to celebrations. May I suggest you celebrate instead the joie de vin (joy of wine)? Take your time; sip, savor and enjoy! Follow and like Wine Mizer on Facebook for mini reviews, fun facts, recipes and more.